I think this game rocks! You get to pick your horse (lots of choices) and train it. You can also save wild horses. And when you're 'done in the game' you can buy a foal. It's a lot like Horsez 2. I REALLY recommend this game, it's highly addicting!!! It could have been way better in terms of graphics. Had the game for about 3 years now. There is not much point in playing after finishing the main story. I recommend you don't buy it. The plot line was poor and you can't really choose the coat color of your horse. Each color depends on the breed. If you decided to buy the game and you finish the plot then after riding in the Hidden Valley (I think) you can find an Appaloosa foal there. It looks the same in every game. Brown and white. Hope this helps. I don't tend to like this game much. It took me an hour and a half to complete. At the end you can breed for foals, but it took me a year just to get one out of the benefit. I'm currently researching to see if its a glitch or not. The graphics are HORRIBLE. I couldn't stand them so after 3 years of having it I sold it. I played the game and beat it in a day. The animation, game play, and story were wonderful but I felt that the designers of the game decided to just get it on the shelves as fast as possible to get a quick buck instead of investing some real effort. If some team were willing to get rights to the game and remake it, they should make the frame rate faster, put more little caring details into the game, and make a much longer and compelling storyline. So much potential ruined by big business! my aunt gave this game to me for christmas, it didn't take long to finish, but after the game is done you can still raise foals and stuff. i recommend it. my first go with it took all but a day, but I insist on having everything perfect, including doing the races three times before the last one :) I Never had an issue with my foals. I ended up running a breeding kinda thing. Buy the foal, train it, raise it into a horse, once all the stars were filled sell it and you get back 3 to 4x what you pay for it. Pretty much all you do is groom and feed them once a day, actual day, and about two days they're a horse and you can ride them. if you buy 2 or 3 at a time it pays off, and considering you can get the foals for a lot cheaper its worth it. I found a wild foal. I found a wild foal by the riverside. It is possible to find the Mustangs! I don't think you see the horse again, there's not much to do after the game ends, sorry. Do you ever see the wild black stallion again after the game is done? After aunt sue says that she does not think that is the last time we will see him, I spent HOURS in the wild horse meadow, but I never see any wild horses. Am I wasting my time, or do the horses show up again? Um... Do you ever see that wild black stallion and his herd again? Aunt Sue says "I have a feeling that that isn't that last of him". Then I spent HOURS in the wild horse meadow, but I never see any wild horses. Am I wasting my time, or do the horses show up again? Thanks! i love this game, it has great graphics and a good plot. 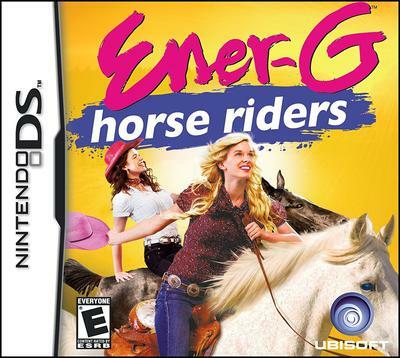 i have this horse game, it's not bad and i love it. this horse game is good. This game is lame. It takes forever to age the foals. How do you make the lame horse happy? do the foals grow up or not? the graphics were horrible. my daughter has it she is 8 we live on a ranch and she is a HORSE LOVER!! and owns every horse thing and didn't like this, she is 9 years old and said for me to see how horrible it was, so that's the FACT :p !!!! This is a familiar title. I then realized this was on my birthday wishlist. So, in three weeks i might be getting this game! Fingers crossed! never tried it. is it good? I liked the game but it only took me like an hour to finish. It's really fun but it takes forever for the baby horses to grow up. how does your foal grow on energy horse riders? All of my foals are now big horses and i luve the game but i am good at games so i finished in 30 minuetes. I recomend!!! This game is really fun, but it only took me about 3 hours totall to beat. So it was getting really fun but then it ended. sure, you can keep playing but there are no more objectives. And the foals don't grow up. Thanks for this review. I didn't know about this horse game, but now I really really want to try it! !